I said I would do it and it’s finally happened. I done gone and got Freshly Pressed y’all! (I don’t know why I’m talking like that. I’m still a little dizzy.) And it only took eight weeks. That’s right. It was less than two months ago when I set out upon my epic journey (sat in comfy chair) and began in earnest to capture the hearts and minds of the blog-reading public (kept doing same stupid posts). Now I have reached the pinnacle of blogginess. I am a master of the written word. All bow down before me and weep! Bwahaha! Okay, maybe not. But it’s still pretty cool. 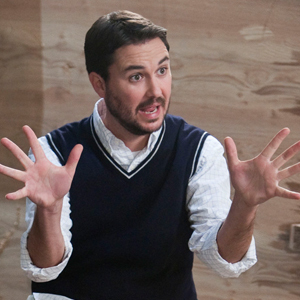 Not satisfied with my Twitter account, Wil Wheaton has swallowed my blog whole. Since this morning, my “best day” has been trampled six times over. After all this time, I’ve finally figured out that I should be writing about what other people find interesting, and not just amusing myself. I am henceforth going to be dedicating my blog entirely to celebrity vomit jokes. As soon as I think of one. Ah, but success is fleeting. As I watch my little square slowly drift down to the bottom of the page, I wonder was it worth all the sacrifice (missed nap) just for the sake of my art? (Art?! Hahahahaha…good one.) Will I ever feel the same way about another post as I feel about this one? Sure I got some new followers and a momentary sense of accomplishment (like you get when you remember to eat your fibre), but in the end, was it worth it? Also, hello new people. Are you regretting your decision to follow me yet? Only 8 weeks though? Damn. That’s awesome!! I knew if I waited you would see the light. Welcome aboard. Why thanks! 😛 Same to you, sir! Huh… I need a period somewhere in the sentence above and fewer semi-colons. I also need more caffeine as I find it tends to aid in proper punctuation usage. You’re not that old. Oh, wait. I get it now. Thanks. Nicely done Sean… Now to earn the badge twice?